Let me introduce myself. My name is Sami and I am your local pharmacist. 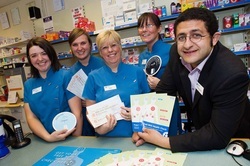 I am proud to be running Lobley Hill Pharmacy. There has been a pharmacy at this site for over 40 years and the current team is made up of Joyce, Sheryl, Micheala, Meda as well as my two delivery drivers Gordon and Davie. My dedicated and friendly team and I are here to help you obtain your medications with ease as well as offering services which help you get the most out of your medicines. We are here to help look after any of you medicine needs so pop in and see us anytime. the best possible service that we can in the heart of the community. As well as our traditional prescription services including our prescription collection and delivery service and rapid repeats service we also offer many other healthcare services from Flu vaccinations, stop smoking service, health checks to over the counter medicines supply and minor ailments advice. Pop in today and see how we can help.